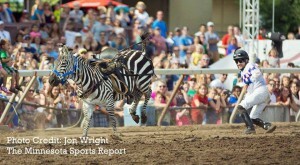 Each year Canterbury Park in Shakopee, MN adds “extreme” races to its usual lineup of horse racing, proclaiming “It’s a real zoo! Camel, Ostrich, and Zebra races!” Join the Animal Rights Coalition to protest this ridiculous and exploitative event on Saturday July 14, from noon to 2:00 p.m. Let’s use our voices to peacefully show Canterbury and its patrons that we don’t believe animals should be used as entertainment, exotic or otherwise. Signs will be provided, but feel free to bring your own. We will protest at the intersection of Canterbury Road and 12th Ave, across the street from McDonalds. This is a high traffic area as it is where folks will come off 169 to head into the park and there are many businesses nearby. Please consider posting a comment on the Canterbury Park Facebook page and contact Randy Sampson, President of Canterbury Park, at rsampson@canterburypark.com and ask him to cancel the event. Please be polite as rude or offensive comments will not help the animals.